This is the original entrance to the fabled garden Lotusland. 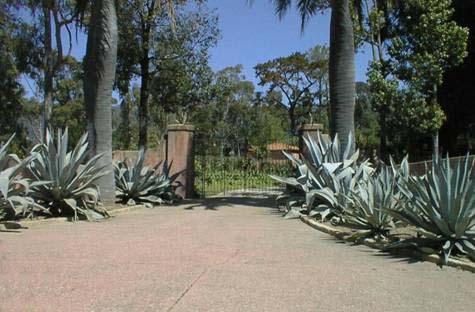 The 37-acre estate and botanic garden in the foothills of Montecito east Santa Barbara was created by Madame Ganna Walska who owned the property from 1941 until her death in 1984 and is now operated by the nonprofit Ganna Walska Lotusland Foundation. Aloe Garden Visit the mystical Aloe Garden at Lotusland. Merritt Dunlap Garden Visit the columnar cactus garden at Lotusland.